Diagnosed with sleep apnea and trouble getting used to your CPAP machine? You are not alone. Some people take to a CPAP right away. Others don’t. If you find yourself bothered by it or taking it off in the middle of the night, hypnosis can help. I picked up mine back in 2010 and am one of those people who has to work at getting used to it. But I am. In fact, I wouldn’t be without it. Sleep better. More energy. Feeling of refreshed in the morning. These are easily worth getting used to with just a little mental adjustments. In fact, I help people not only accept their cpap unit but come to love it for the wonderful benefits it provides. If you are local to me in Rhode Island or Massachusetts, I invite you to let me help you adopt a positive, accepting attitude toward your CPAP machine as the life-saver it is. Get to sleep easily and stay asleep. After all you went to the trouble of the sleep study. You were diagnosed by your physician as having sleep apnea. 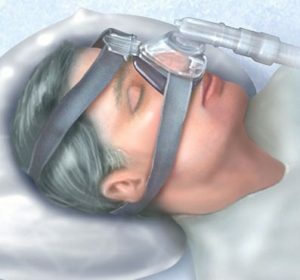 Therefore you know you would benefit from using the CPAP system if you used it. Don’t be one of the people who tries it for a while and gives up on it. If you are not local to me, let me suggest you find a qualified hypnotist in your community and ask him or her to help you. Any clinical hypnotist should be able to talk with you about your problems and design a program to help you, whether they are familiar with CPAP or not. You might bring the unit along to the first session so they can see for themselves what is involved. Easy does it, but do it. Start by using your CPAP for short periods during the day. Adjust the mask, tubing and straps to get fit right. Ask for a different mask if yours is too uncomfortable. A full mask might work better if you breathe through your mouth. A mask with nasal pillows should decrease nose discomfort. A mask with a chin strap will help keep your mouth closed and reduce throat irritation. Use your CPAP consistently – every night and during every nap. This will make the adjustment easier and ensure maximum benefit. Keep your CPAP unit clean. Self-explanatory. Try a session or two of hypnosis. It can’t hurt and it might be all the added support you need.